Shopping for swimsuits is great motivation to step up the workout routine. I've mentioned before that I workout at home... here's a look at my routine. Why not? These are my personalized NikeiD Shox Turbo kicks. I had to settle for "Miss Linds" because apparently Lindsay is copyrighted. I tear out workouts from my fitness magazines and save them in this binder. The majority of articles are from Self. I don't know what I would do without Exercise TV at home. Have you ever done any of the workouts? I watch them On Demand and have also downloaded them on my computer for traveling. Holly Perkins is my favorite trainer and I have been combining her Fitness 360 workouts with additional cardio on the treadmill. I follow her on Facebook and love that she is highly interactive and always sharing workout as well as healthy living tips. Funny that I am posting this today because Monday is usually a hectic day so I rest. Might have to squeeze in a little workout tonight! Um, I know this post is about workouts...but I'm in love with that bathing suit!!! I heart that lobster suit! So cute! And good idea to keep the workouts in a binder- I need to do that too! Your tennis shoes are so cute! 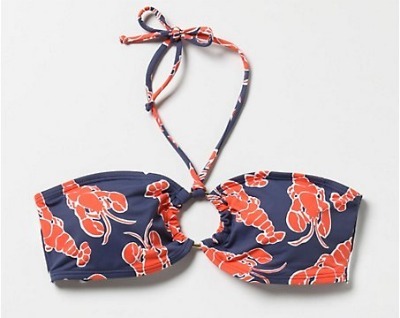 I love anthro bathing suits, but they are SO expensive. I'm waiting for VV to release theirs before I buy one this season. I used to keep a workout binder but I always get bored when doing strength exercises!! I love the tennis shoes!! That lobster suit reminds me of the new Tipsy Skipper pattern! We have too much in common! 1. The lobster suit is on my wish list! 2. I'm obsessed with Self, and my ideal job would be to work for them one day. The binder is so creative! I always tear mine out and put it in a gym journal, but the binder is so much more efficient! that is a really really great idea to tear out workouts and save them in a binder. I want to get the NikeID Lunar glides and i want them in some crazy colors. so fun! Lindsey is copyrighted?? That makes no sense! It better not be LiLo that copyrighted it - lord knows she doesn't wear tennis shoes! the editor of self is an alpha phi, so i get a free subscription! i love it-- so many good workouts, recipes, and articles! 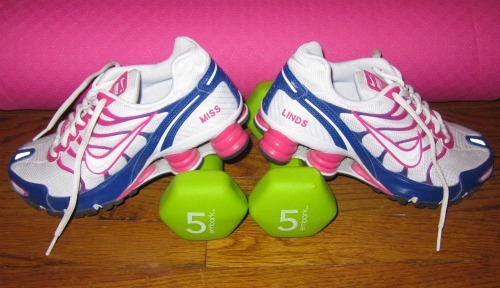 Love those personalized shoes! I never thought to save the tips from magazines! Smart! that swim suit is so great!